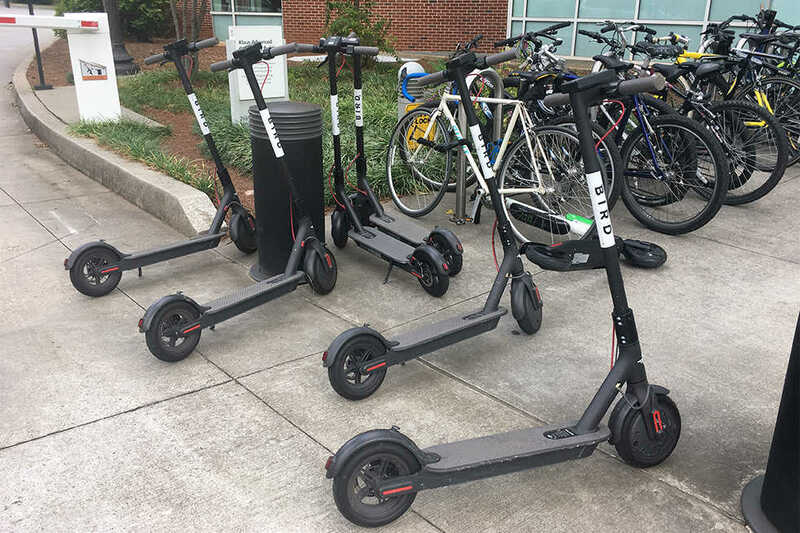 Starting Monday Sept. 24, the Georgia Tech Police Department (GTPD) began enforcing state laws associated with riding vehicles such as electric scooters, bicycles and even golf carts. Riding on sidewalks, riding across crosswalks and ignoring traffic laws can now result in a ticket. GTPD had previously made over one hundred stops of violators, but had been giving out safety flyers instead of tickets. The flyers address multiple laws relating to motorized scooters, explaining the consequences of breaking these laws. Additionally, they include general bike and pedestrian safety tips such as securing bikes with a U-lock and always using crosswalks as a pedestrian. Scooters and bikes are now expected to stop for red lights and stop signs, yield to pedestrians in crosswalks, and follow all other state laws. Capt. Anthony Leonard from the GTPD emphasizes that scooters and bicycles are treated as vehicles under state law. “What we are going to be enforcing is the Georgia law. Which means we’ll be enforcing all the rules of the road, so everything that a vehicle has to do, the scooters have to do. Everything that a vehicle has to do, the bicycles have to do,” Leonard said. Leonard clarifies the reasoning, explaining that it is dangerous when bicycles and scooters ignore stop signs and traffic signals. Bicycles and scooters are not allowed to be ridden on sidewalks and crosswalks. However, while riders walk their vehicles, they are considered pedestrians and can use crosswalks and sidewalks. These vehicles are all still allowed on shared pathways around campus, since the paths fall under Georgia Tech policy instead of state laws. According to the educational flyer, fines can be $130 or more, not including court costs. Such fines are administrated by the City of Atlanta Municipal Court, not by GTPD. Segways, mobility scooters and similar vehicles are excluded from these regulations because under Georgia state law, they fall under the category of electric personal assistive mobility devices. According to GA Code § 40-6-320 (2014), people are allowed to operate such vehicles on sidewalks as pedestrians.